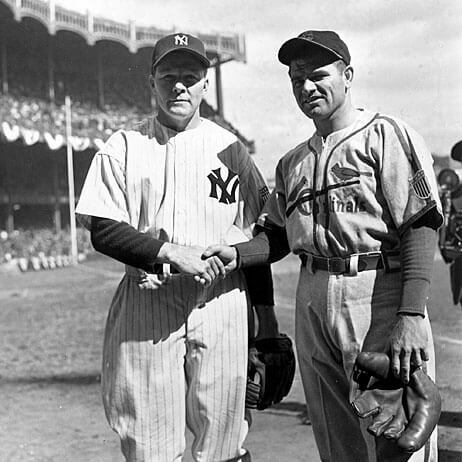 The 1943 World Series matched the defending champion St. Louis Cardinals against the New York Yankees, in a rematch of the 1942 Series. The Yankees won the Series in five games for their tenth championship in 21 seasons. It was Yankees’ manager Joe McCarthy’s final Series win. This series was also the first to have a ‘World Series highlight film’ made for it (initially, the films were created as gifts to troops fighting in World War II, to give them a brief recap of baseball action back home), a tradition which continues to this day. The 1939 World Series featured the three-time defending champion New York Yankees against the Cincinnati Reds, who were making their first Series appearance since winning the scandal tainted 1919 World Series. The Yankees swept the Series in four games for the second straight year, winning their record fourth consecutive title they would later win five straight from 1949 to 1953. Yankee manager Joe McCarthy won his fifth title, tying the record held by Philadelphia Athletics manager Connie Mack. The 1938 World Series matched the two-time defending champion New York Yankees against the Chicago Cubs, with the Yankees sweeping the Series in four games for their seventh championship overall and record third straight (they would win four in a row from 1936 to 1939, and five in a row later from 1949 to 1953).